Every so often my husband and I have a little argument. It surfaces out of nowhere, often over something inconsequential, compounded by factors of little sleep or irritability. And in that moment, although things may have been running quite smoothly – we may have had some good times together lately – we let our guard down and what surfaces to the top and out of our mouths is something not very pretty and not very typical of us. The little argument turns instantaneously ugly. Something like that happened to us just the other day. It happened to be February 14th – the day of celebrated love, but that’s just irony (and no, we weren’t arguing about anything related to Valentine’s Day). The issue itself wasn’t very important, it was more how our interactions went. He said something, I said something. He responded in a condescending way that made me feel very angry, made me feel like he was treating me like a child. At that, I snapped back with venom, throwing in a swear word to drive home the point about my displeasure at being spoken to in that manner. It was childish, it was embarrassing (especially as the boys were listening in, from the other room). And a couple of hours later we were laughing about it, thankfully. Still, it can be alarming when you think about what you’re capable of saying or doing in the heat of a moment, and how things can change from peace and love to loathsome feelings in just a short while. In most marriages, a time will probably come when you feel absolute hatred towards your spouse – whether for a few moments or a few months. Everything they do or say may start to grate on your nerves, and you may begin to view them as the enemy, rather than the love of your life. They may even become the person you like least in your circle of friends and acquaintances. (Whilst I’ve only experienced these emotions momentarily, I’ve heard from others for whom it has been a longer term struggle.) How could someone you used to love with a passion become the object of your utmost annoyance and hate? It’s at times like these that I’m reminded of a poignant scene in a very old episode of Grey’s Anataomy (season 5). As the lead characters’ wedding plans go awry due to a friend’s illness, Meredith puts together a light-hearted series of vows on a Post-it note – as a kind of informal wedding ceremony. One of them states the promise to ‘Love each other even when we hate each other’. I love that vow – the sheer genius of the nuances contained in the statement – and think it should be written into every modern day wedding ceremony. It’s kind of funny and ridiculous, and yet so very true. Are you willing to overcome any difficulties and bumps in the road that lead to harbouring feelings of hate towards your partner, and aim to work through them, based on actions of persistent, unrelenting love – a love that continues to love against the odds? Knowing, beyond a doubt, that those negative feelings need only be temporary and that love can take root, be cultivated and blossom once again, through humility, patience and the winning of each other’s hearts– just as it first did in the beginning of the relationship? It’s a risk to love, precisely because love can be rejected and trampled on. How crucial to accept that love in marriage will be assaulted at times from every angle – by pressures and circumstances, by people or situations, by moods and disagreements. As I said, it’s surprising what you’re capable of when you’re under pressure. The incident with my husband in our kitchen drives home the fact that I am a flawed individual who is easily capable of sin – even that which I may have despised and criticised in others. I need to be very careful, and realise that it’s when I become smug or fall into pride about how good I am compared to others, that I can so easily fall into such sin. And when you mess up in front of others, in this case – my children – it serves as a reminder that you’re so fallible, which is a very humbling experience. Any masks of self-righteousness crumble away and there’s no hiding behind a squeaky clean image. Yet, at the same time, such moments can allow you to recognise your own shortcomings and to develop gracious attitudes towards others who are struggling or who fall into behaviours that are less than godly. You can become more accepting of others. Marriage is a perfect environment for the testing of one’s character – as two distinctly different people living in close quarters are forced to learn to give and take and reconcile their differences to enable some sort of harmony to flow. But simply co-existing is not a goal worth aiming for. Love should be the default setting in the relationship, where each one chooses to respond in love and affection rather than anything less, even when hate tries to bubble to the surface. And in Christian marriage that means leaning on grace and learning to love as Christ loves us. The more of Christ in us, the less breeding ground for hate to fester. Sometimes we can learn something positive from a popular American TV series. In that one quote, all the marriage vows can be summed up. In embracing that one quote, we’re choosing to let love win. It’s a question that may easily induce mild panic or annoyance in most people. What demand on our time or energy is going to be requested of us? We may smile outwardly and respond, while inwardly gritting our teeth. I don’t mean those kind of moments – times when others are asking for a favour or want to talk intensely for a while. I’m talking about the little moments in-between the hubbub of activities that dominate our lives. Our days are made up of everything from eating, drinking, sleeping, washing, work and chores to leisure pursuits, projects, plans, errands, to caring or managing, learning and doing. In between all this busyness, we often find ourselves faced with a moment. A person or situation observed where we could make a difference in some small, seemingly insignificant way. A moment where we could walk by or a moment when we could engage. In his gripping life story, ‘Ghost Boy’, Martin Pistorius tells of being imprisoned by his illness-onset disability, unable to communicate or manoeuvre his body, even after his brain functionality had been restored, unbeknownst to his carers. He tells of a time sitting in a car on the street, waiting for his father to return, when a man walked past and smiled at him. Used to being ignored and talked over, just this small, friendly gesture and acknowledgement of his existence restored his hope in humanity, giving him a reason to not give up on living. That one smile made a big difference not just to Martin’s day, but also his life. Frequently we use our spare moments to read or to look at a screen; I know I like to use spare minutes to read the news or look at social media on my phone. On Sat, while visiting my elderly mother in a busy hospital ward, I was on the other side of the curtain while two nurses were carrying out a procedure on her. I looked around at the other elderly women on the ward. One frail, white haired woman in the bed next to mum had been sniffing and lightly coughing. Looking around for nurses or auxiliaries, I saw none. All staff were otherwise occupied. I decided to say yes to the compassion that rose in my heart and to engage. I went to the nearby reception desk and asked if I could take a clean blanket from the trolley for the lady by the window? A receptionist said yes. Collecting one of the standard NHS blue blankets, I folded it in two and lay it on top of the coughing patient, also pulling up her sheets to cover her shoulders and neck. I asked her if she’d like some water to drink. Again, she nodded, so I picked up the plastic cup on her table and guided the straw to her lips. As I set the cup back down, she summoned up the energy to whisper ‘Thank You.’ My heart melted. What I did took less than a minute, but it meant a great deal to her. No visitor had dropped by to see her during the three and half hours afternoon visiting slot. 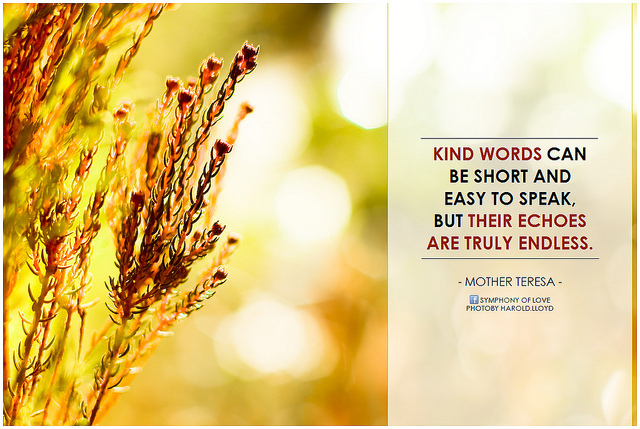 Kindness doesn’t necessarily take up a whole lot of our time or effort. Sometimes we just need to respond to that gentle call to action that stirs up within us during unsuspecting moments. I will certainly be grateful if other people visiting relatives on Ward 6 of James Paget University Hospital in Gorleston show kindness to my fragile mum. We should never underestimate the power of small acts of kindness. Not only is the recipient of such acts blessed; the giver is also rewarded with an enormous sense of purpose. It’s in giving to others that our humanity is revealed and we glimpse something of our compassionate God, who loves to work in us and touch others through us. The line from a song we’ve been singing at church recently kept resounding through my head later on – “Let heaven come.” When we show compassion and kindness, we experience evidence of God’s kingdom being revealed on earth. That’s when a part of heaven touches earth.